Based on its nominal gross domestic product, the economy of Greece is ranked 42nd largest in the world. The Greek GDP is mainly based on the secondary and the tertiary sector at a combined percentage of 97% (12% and 85% respectively), while agriculture makes up for 3% of the gross domestic product. Greece is a major producer of a number of agricultural products, while its economy is also based on tourism and shipping. The Greek GDP marked a steady increase up to 2007, but was then hit hard by the Great Recession of 2008 and the sovereign – debt crisis of the country. Since 2008, the Greek economy has been shrinking on an accelerating rate. Lately, the shrinking of the economy has started gradually decelerating, showing figures that were marginally better than expected. This has raised hopes that this could mark the start of the end for the crisis after a six – year period. 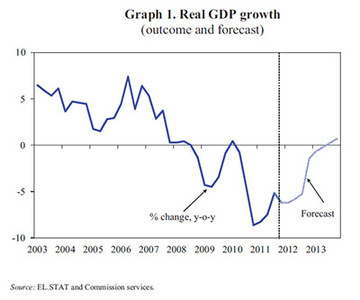 However, it is not yet known whether the Greek economy is finally stabilizing. Achieving a primary surplus for the 2013 fiscal year would increase the trust of investors to Greece, therefore making the country able to seek further debt relief and making one step closer to recovery.